Crowns: The terms dental crowns and caps are synonymous. If dental decay, cracked fillings, root canals, clenching or grinding the teeth have caused extensive damage to the underlying tooth structure a dental filling may not be a sufficient restoration. The only way to completely restore the cosmetic appearance and function of this tooth is often full coverage with a dental crown. The good news is that a completed dental crown looks and feels like a natural tooth. Bridges: When teeth are missing a series of changes that can impact your overall dental health and jaw function may be initiated. The adjacent teeth may start to drift or tilt into the space, and teeth in the opposing jaw may start to shift toward the area of the missing tooth. 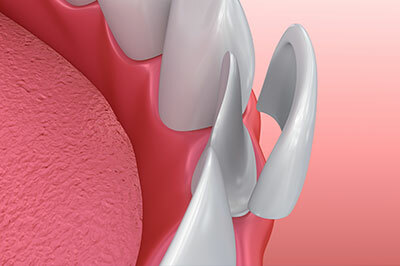 It is therefore important to replace the single tooth or multiple teeth that have been lost. One of the best options to prevent the consequences of shifting teeth and to restore full function to a small edentulous section in the mouth is a dental bridge. When more than half of the tooth's biting surface is damaged, a dentist will often use an inlay or onlay. At the second appointment, the temporary sealant is removed. Dr. Molina or will then make sure that the inlay or onlay fits correctly. If the fit is satisfactory, the inlay or onlay will be bonded to the tooth with a strong resin and polished to a smooth finish.